The United States Geological Survey reported the earthquake, which had a magnitude of 4.7. 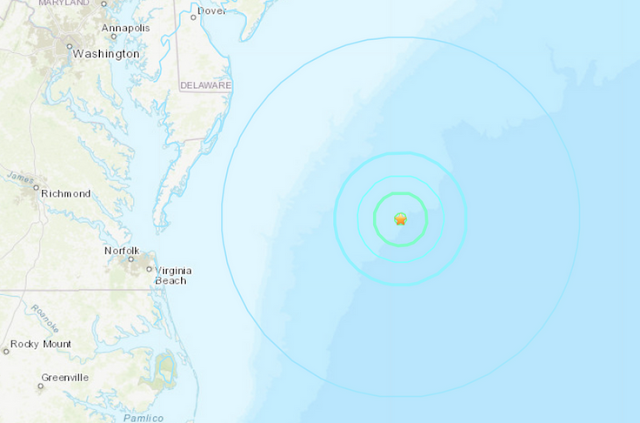 The earthquake occurred approximately 136 miles off the coast of Maryland at about 6:30 p.m. Despite the far distance from shore, it is possible an earthquake of this magnitude could be felt on land. USGS showed about 30 people — most in Maryland, Delaware and Virginia — reported feeling effects from the earthquake as of about 8 p.m. Tuesday. The Earth's crust near the eastern part of the United States is more rigid, which is why earthquakes tend to be felt from farther distances than those that occur off the West Coast, said Jana Pursley, a geophysicist for USGS. But it is highly unlikely this earthquake caused any damage on land. By the time the seismic waves travel through the water to the coast, the shaking significantly weakened, Pursley said. As of about 8:45 p.m. on Tuesday, the National Oceanic and Atmospheric Administration had not reported any tsunami activity off the East Coast.